Haati Surey is a place which is no stranger to landslides. 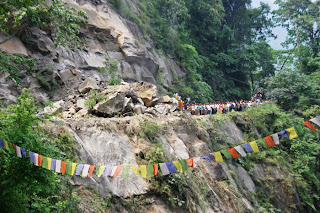 In 2007, a massive landslide here resulted in National Highway 31A (which links Siliguri to Gangtok) being blocked for over a week. 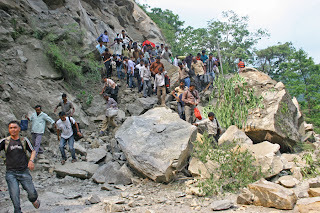 The above rockfall occurred on 11Jun2010 and I am not too sure how or why it occurred because we are running deficient in rainfall both in May2010 and whatever rainfall we have had till date in Jun2010. One plausible reason for this rockfall maybe the heavy traffic on NH31A and the consequent vibrations which caused this?? Needless to say this rockfall caused tremendous problems in terms of missed flights, trains, hotel bookings and so on for all us living in this area.